We have come to the end of today's French Open text service. We will be back again on Sunday for more of the same. There aren't many words really left to describe the phenomenon. She must now be one of the favourites for the title. An ace brings up match point. Williams gets a little snatchy with the winning line in view - Gorges steams back with three great serves. However, instead of looking for the quick winner Williams opts to play the 'rally game'. She comes out on top with that tactic in the next point. But Gorges, perhaps realising that her time at RG is coming to an end, produces another two good serves to ensure that Williams will have to serve for the match. I'm sure the 23-time Grand Slam singles, 14 doubles and two mixed doubles champion is quaking. Back comes Gorges with a cracking flat return. Williams pulls out another booming serve which her opponent fails to cope with. The American is one away from a match against "her bestie*" Maria Sharapova. Gorges is beginning to gamble - seeking the early winner on the Williams serve. It hasn't really worked so far. 15-0 turns to 15-15 thanks to Williams' third double-fault of the match. Big serve with spin, followed by big serve with spin. 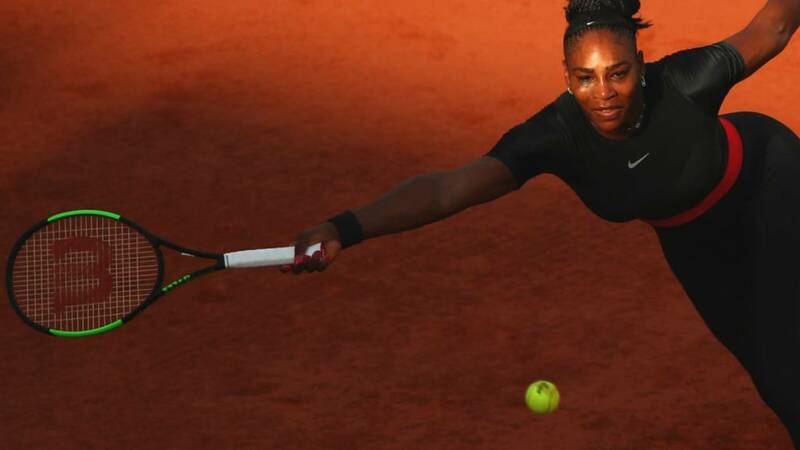 This is a seriously impressive performance by Serena Williams. Remember, it is only her third singles match in more than two months, and she had only played four more in the previous 15 months. Williams is making remarkably few unforced errors and the quality of her returns have put enormous pressure on Gorges from the first ball. A welcome two points for the German - a quick pick-up and shot down the line, followed by a big ace. Williams wins the next before the German strikes another wonderful winner past her more celebrated opponent. An uncharacteristic error from Williams, coming to net, sees Gorges seal the game. Camera lenses are being turned away from the court and clicked at somebody in the stands. Must be somebody super famous. Meghan Markle and Prince Harry? Not them. It's someone wearing a Paris St-Germain baseball cap. Neymar? Nah. Playing Serena Williams must be like doing a two-hour long HIIT class. The clock shows an hour's worth of tennis has been played and Williams is only three games from victory. Make that two as Gorges returns a thunderous serve into the net. Williams gets a bit lucky with a pick-up right near the net - but still, you have to have the atleticism to reach those in the first place. As quick as you can say "mommy" the American has three breaks points. Gorges saves one with her 10th ace. The 36-year-old takes her next chance leaving Gorges flat-footed with a return. There's definitely a badge winging its way to her now. Williams hits a forehand fractionally too deep to the relief of the German. That's gutsy from the world number 11. "Fight Julia fight!" - at least that's what I think one or two are yelling. Williams has two game points. Now just the one after making her second double fault. Great return from Gorges which forces Williams into firing a forehand into the net. Not since the first game had the German had deuce. Wow! Two more break points for Williams. Gorges needs to pull out something special here - and she does. Deuce - good effort the Bad Oldesloe-born player. Ah, but no Julia... you're being overwhelmed again by this Thanos of tennis greats. Break point. Mike Tyson is on court - not actually on the surface. Anyway, Williams seals her service game as Gorges tries to be a hero herself with a forehand return. She puts a wee too much power on it. Well, that was better from Gorges - she holds. If she improves on the stat of '71% of points won on her first serve' then she'll cause Williams some problems. Actually, now that I've typed it out I realise that's quite obvious. Guess who's back? Not the D.R.E. but the G.O.A.T. Serena makes just three unforced errors in a set which took her 31 minutes to wrap up. Gorges, on the other hand, has been wild and sprayed balls all over the place. Gorges is trying everything in the rallies to outwit Williams but it's not working. Her attempt to produce a loopy return fails to land inside the court. This is it for Williams. Nope. Gorges produces her best shot of the match - a flying angled one-handed backhand. A diving equivalent would be a triple somersault with pike and a double twist. Williams, however, will not be outdone again. She comes to the net and pats down the German's return. Williams seems to be picking up everything. Everything!!! Williams makes an error!!! Her return from the baseline has too much on it. Then another, with an inaccurate backhand thumper down the line. Gorges holds with her seventh ace. The American to serve for the set. 40-0. It's just not happening for Gorges. Even when the German returns, Williams smacks down a brilliant flat double-handed backhand. This is truly superb tennis from arguably the G.O.A.T.